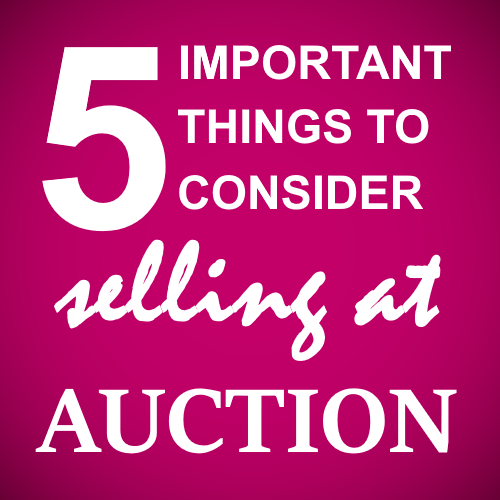 Our quick guide explains the five most important points to consider when selling your property at auction. Public auction offers property owners the opportunity to sell with the knowledge of a completely transparent sale, without any interference from estate agents. But auction certainly isn’t suited to every type of property and sometimes the owner’s circumstances mean they need a more managed sale. Properties with potential sell best at auction. For example; houses in need of modernisation, flats requiring lease extensions and properties with development potential often achieve better sale prices at auction than they would through an estate agent sale. Although there’s no reason why any type of property can’t be sold at auction. Commission charged by the auctioneer is typically in the region of 2%+VAT of the final sale price, but it’s not unusual to pass some of the cost to the buyer. Some auctioneers also charge an entry fee of anything from £250 upwards. All-in-all the costs work out to be around the same as a seller would expect to pay a high street estate agent. Read more about auction sale costs. Reserve prices are typically set at around 15% below market value. As buyers compete against each other on auction day the price is bid up to a higher level. But if bidding doesn’t reach the reserve price the property will fail to sell. Read more about the auction reserve price. The closing date for entering a property in to auction is 3 to 4 weeks before auction day. During that time the auctioneer carries out marketing activity to generate interest in the property. When the property sells on auction day contracts are legally exchanged and completion takes place 3 to 4 weeks later. Read more about the auction sale process and timings. If a property sells on auction day, sold means sold. Neither the buyer or seller can back out of the sale. This is different from an estate agent’s sale where sold only means “sold subject to contract” and the sale is liable to falling through for any reason. Whilst a legally binding auction sale is a good thing for the seller who wants a committed buyer, it doesn’t offer much flexibility if the seller needs time to find their next home!